Our task is not only to destroy you physically, but also to smash you morally before the eyes of the society. As World War II wrapped up with a rousing Soviet victory on the eastern front, the Red Army and NKVD segued from fighting the Wehrmacht to fighting anti-communist Polish partisans. The casualties of this massively imbalanced conflict were Poland’s doomed “cursed soldiers”, who carried on a hopeless resistance to Communist power for many years. We’ve met their Warsaw Pact analogues elsewhere in the forests of Russia’s Cold War satellites. 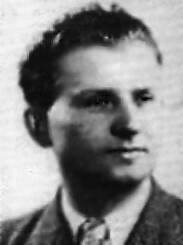 Lukasz Cieplinski; he was the head of WiN in 1947. All were members of Wolnosc i Niezawislosc (“Freedom and Independence”), an anti-communist underground formed after World War II; our principals today had been rounded up in 1947-48 and consequently had a good three years or so to enjoy the famous hospitality of their captors. I even sat on an electric chair with some sort of an apparatus. They attached clamps to my hand and ear. Once they turned it on, blood flowed from every crevice in my body … They also pumped water into me. They suspended me upside down from a beam attached to the ceiling. They gagged my mouth and dunked my face in a bucket full of water. And I would freeze. They told me only to give them a sign that I had hidden weapons. When I did, they freed me and told me to sign my confession. I’d tear them up. So they continued to torture me. They poured kerosene into my brother’s bucket [before they dunked his head in]. In comparison to that the beating all over one’s body was pleasure. Though some people managed to withstand the torture, quite naturally many broke down and confessed to whatever was proffered and implicated whomever was targeted. Very often, those confessions would lead straight to a capital conviction. On the strength of such evidence, this date’s harvest, many of them already suffering crippling injuries from their interrogation, received a show trial in October 1950 with no real defense. They were shot one by one several minutes apart on the evening of this date by prolific Polish executioner Piotr Smietanski. This site maintains a more thorough (and pro-WiN) history of the movement, including many photographs.